I woke up earlier than I expected today, Hungary is the easternmost country I am travelling through that is still on the same time zone as Spain, and at ten past five in the morning the sun was already shinning. I managed to get some more sleep before getting up and putting everything back on the bike, as I expected today to be quite a hard day – I remembered Romanian roads from a trip there three years ago and they are hard. 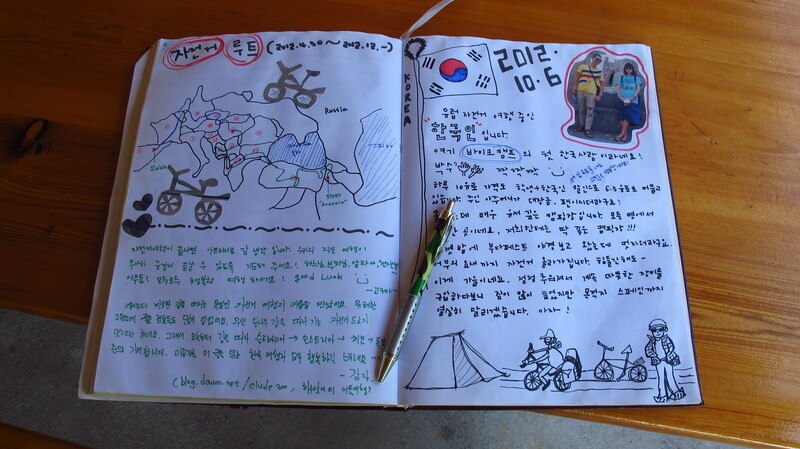 I had a coffee while I wrote a quick entry into the camp’s guest book, and then spent some time flicking through its pages and reading a few of the stories there. After a few minutes I was surprised to feel a tear forming in my eyes. There are hundreds of people travelling around the world by all possible means and I had read about some of them on internet forums, but this was different – I was touching the very same pages those people had touched before moving on to their following destinations. The previous night I had tried to put the coordinates for my next destination on the GPS, only to find that whatever settings, it refused to give me a route. I tried choosing a destination in Hungary, near the border, but the result was still the same. 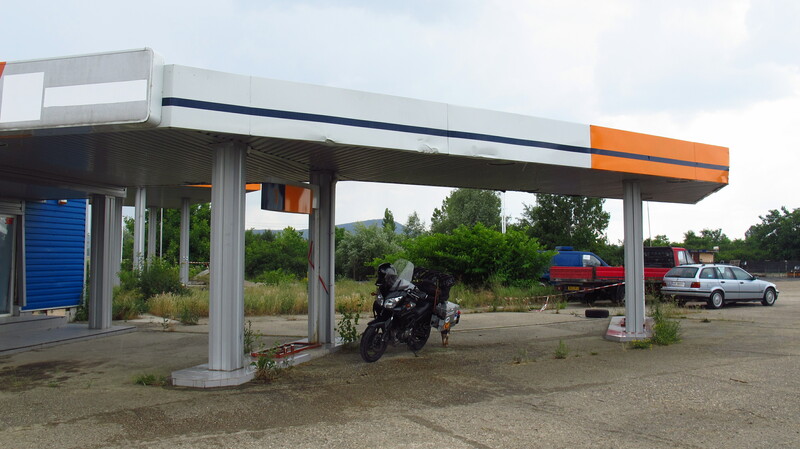 In the end, it only agreed to give me a route to a town near the border and on the motorway, so after leaving Budapest I stopped at the first petrol station I found to pay for a matrika, the vignette that allows you to travel on motorways. I had managed to get through Slovenia, Austria and part of Hungary without paying for one, so I was a bit bummed. It turned out to be quite cheap (I do not know exactly how cheap, I still have not had time to calculate today’s expenses) and in an hour and a half I was at the border, which meant that I had all the afternoon ahead of me to enjoy the Romanian roads. On the trip to Romania three year ago, my friends and I stayed at a place called Terra Mythica, near Alba Iulia. We were not quite sure what kind of place it was, but it was the only thing we could find in the region, so we made a booking. We got there at about 1 am to find it was a sort of summer camp full of children. Against all odds, we had a wonderful time – Dalina, the owner, and some of the stuff joined us after dinner once all the kids were in bed and we had one of the hardest drinking sessions I remember. To cut a long story short, we became good friends and she visited in Barcelona a couple of times, so when I was planning the trip I decided to take a little detour and come back to Ighiu, and I was really looking forward to it. At the Romanian border I was stopped by the police for the first time in my trip, but they only checked my passport and waved me on. I stopped just past the gate at a small shack that changed money and sold road tax, which is compulsory in Romania, whether you take the highway or not (in fact, there is only one highway, between the capital and the coast). I got some leu and discovered that it was not necessary to pay tax for the motorbike, so I rode on happily. The roads were better than I remembered from the last time I was here, or maybe riding all the way from Spain meant that the transition had been more gradual than getting off a plane and into a van. In any case, I made quick progress and soon realized that it was already well past 2 pm and I still had not had lunch. I started looking for a nice place, but roadside picnic areas or public parks are notoriously difficult to find in rural Romania, and the kilometers went by without a proper place turning up. The clouds were turning a nasty shade of black, and this time there were no clear skies ahead, so it was becoming more and more pressing to stop not just for lunch, but to put the waterproof lining on the suit. Then, as the rain began, I spotted a petrol station. I had not seen one since the border, and even though I still had fuel left, I was starting to worry, so I was glad to find one. As I got closer, however, I saw that it was abandoned. Well, at least it had a rood under which I could get changed and eat something. I performed a little strip-tease to the delight of the lorry drivers passing by and then sat down to eat a kind of Hungarian sausage I had bought earlier and some bread and fruit. I swear if I had been doing this trip on a car instead of a motorbike, I would have taken her home. The poor thing was clearly afraid of people, God knows what bad experiences she might have had in the past. I threw her some meat and she ate it from a distance. She stayed there all the time I was at the petrol station, but did not allow me to get closer than a couple of meters, she kept her distance. After saying goodbye, I got on the bike and set off again, happy to see that the rain had stopped. I was soon regretting having put the waterproof lining on, as it was getting hotter, and I was quite sweaty when I stopped for fuel at a petrol station that was quite far removed from the ones I had been using so far. I had to check twice to make sure this one was not abandoned. 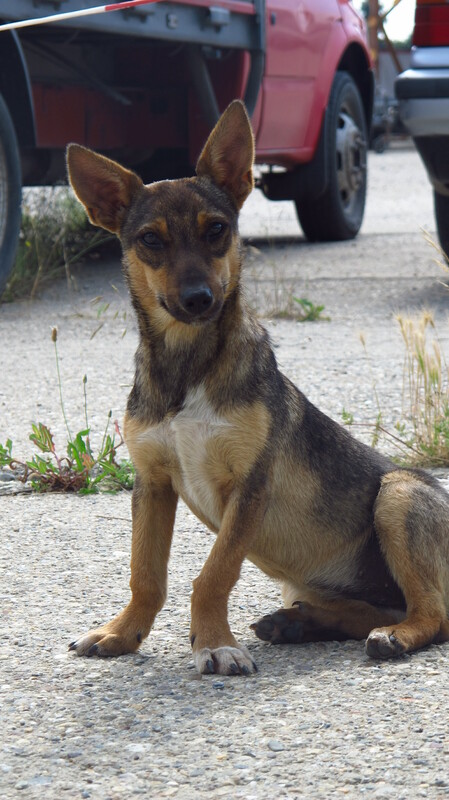 By mid afternoon, the landscape changed from the flat corn fields I had been seeing from Hungary into hills and valleys covered with forest, and I was soon reunited with that old friend from three years ago – the Romanian pothole. The Romanian pothole is not the kind of broken asphalt or depression on the road we might be used to encountering in Western Europe. This indigenous beast that populates the country roads in large numbers is generally round or ovoid in shape, with sharp, cliff-like edges, and deep enough to swallow the front wheel of the bike. It normally dwells on mountain and forest roads, where the harsher weather has deteriorated the road more, and to make matters worse, they were filled with water, making them more difficult to spot. Needless to say, hitting one would mean, at the very least, a badly damaged front rim and suspension, not to mention risking a very nasty accident. It was cold again, but the weather got better in the afternoon, and as I rode the country roads, avoiding the potholes, I remembered what a great country this was. I got to Ighiu at half past eight, and was delighted to see Dalina again. Things were hectic at the camp, with 70 children to be taken care of, and still fully dressed in riding gear and before I could unload anything from the bike I was sat down at a table for dinner with Dalina and the rest of the staff who, came from places as far apart as California and India. I had a great time, and after dinner, I had a shower, got changed and sat down to write and have a chat with Rushil, who also has a motorbike back in India, and showed me pictures of Khardung la pass, the highest one in the world. If I ever go to India, I will definitely hire a motorbike and ride it! 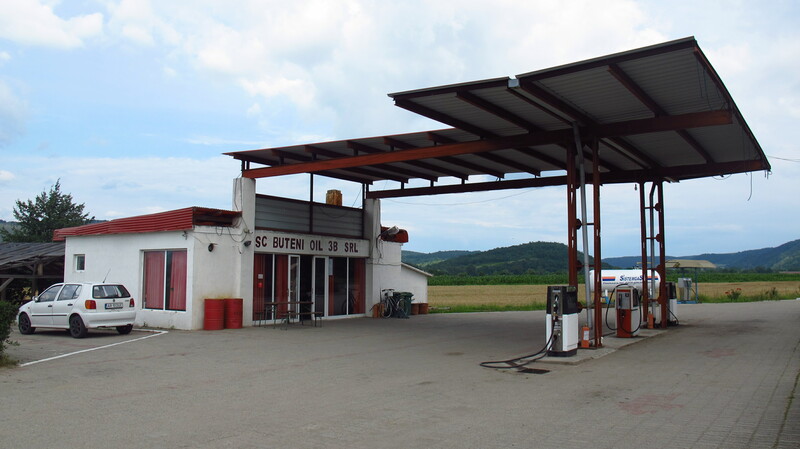 This entry was posted in Stroming The World 2013, Travel and tagged Ighiu, petrol station, Romania by Kilian. Bookmark the permalink. Oh, yeah, I’m familiar with these problems with waterproof clothes. And rain coats. I feel your pain. 🙂 Sometimes on our trips we are taking them on and off like we are on a fashion show, haha. Great to read about your travels! I am an American living in Bucharest and me and my Strom have been all over the place. 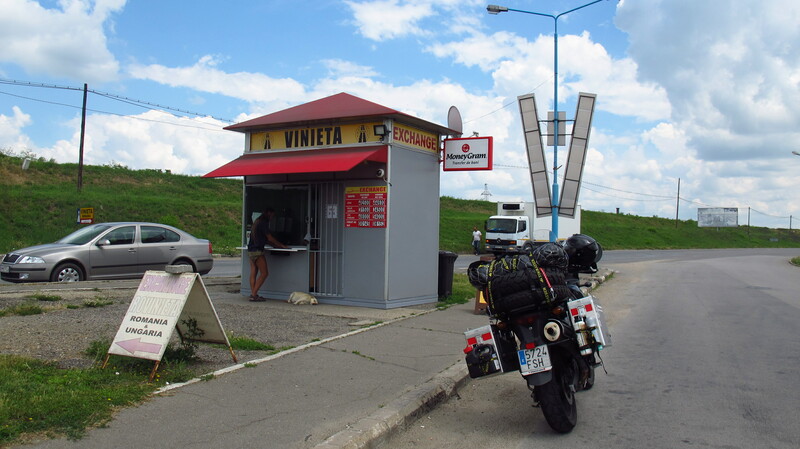 But I am sorry to break it to you, the Romanian vignette (road tax) isn’t required for motorcycles, they are exempt. I really enjoy reading about your trip. 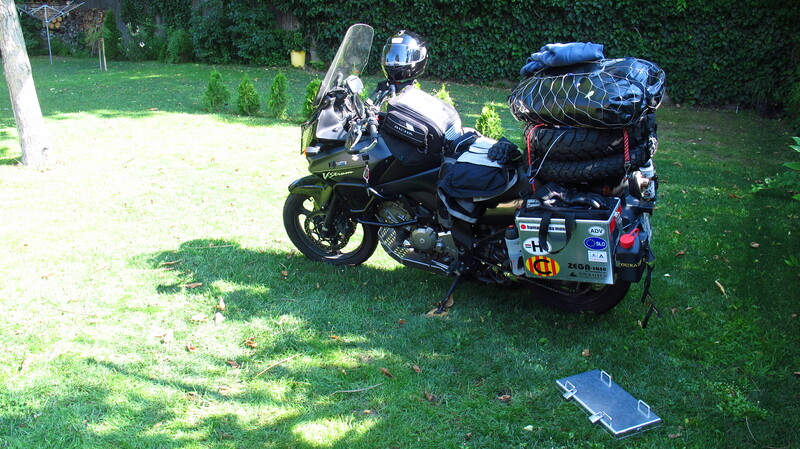 I am an American living in Bucharest and me and my Strom have been all over Romania. But, I hate to break it to you but the Romanian Vignette (road tax) isn’t required for motorcycles. They are exempt. Anyway, good luck and have a safe trip! Welcome to Romania 🙂 I am glad that you find a friend here. Did she gave you “palinca” to drink? Thanks! Not this time… I had to ride away early in the morning, but she gave us a lot of palinca last time we were there!